By coincidence, today’s release of final GDP data confirms – rather than negates – the economic picture that I painted yesterday. “The economy slumped a downwardly revised 2.4% in the first quarter, which was narrowly the largest decline since the second quarter of 1958. The annual decline in output was 4.9%, the largest since records began in 1948.” The news didn’t affect the Pound, given that it refers to a period that ended a few months ago. At the same time, it revealed the seriousness of UK economic troubles and the depth of the hole that it must climb out of in order to achieve recovery. But the Bank’s rate cuts are being offset by the Pound’s recent 15% rise- its strongest quarterly performance in over 20 years. Based on some models, such a dramatic rise is equivalent in force to a 4% hike in interest rates. The quantitative easing program is also beset with problems, namely that 50% of the newly printed money has been used to purchase assets/bonds from foreign investors, which are more likely to take the money out of the British economy. The government, meanwhile, is probably out of options, and may have to even unwind some of its fiscal stimulus due to lack of funds. In fact, the “deterioration in the U.K.’s public finances…prompted Standard & Poor’s to warn on May 21 that the country could lose its AAA debt rating. The firm estimated the cost of propping up Britain’s banks at 100 billion pounds ($166 billion) to 145 billion pounds and said government debts could double to almost 100 percent of gross domestic product by 2013.” The budget deficit in 2009 alone could surpass 15%. Still, there are optimists. Says one analyst, “The U.K. economy’s heavy dependence on the finance sector, recently seen as a big flaw, has also turned into a benefit. ‘Sterling is basically a bet on global financial well-being.’ ” Also, “Foreign demand for gilts rose to an all-time high in the first quarter of this year as concern the world economy would stay mired in a recession drove investors to the relative safety of government securities.” But these notions are somewhat contradictory. When you map these ideas against the backdrop of the Pound, you can see that is benefited primarily from the perception of recovery- not from the safe-haven perception. These optimists believe the Pound will rise as high as $1.80 against the USD and €1.40 against the Euro. Under the best-case scenario, quantitative easing and government spending will trickle down to the bedrock of the economy, and will be unwound immediately after the economy enters a recovery period so as not to spur inflation. Under the worst-case scenario, though, the government will continue to run large budget deficits and fail to find enough buyers for its debt. The resulting stagflation would cause investors to rush for the exits and for the currency to collapse. In all likelihood, the actual outcome will fall somewhere in between. After a nearly 20% rise against the Dollar, the British Pound has been rangebound for nearly the entire month of June, with one columnist likening the situation to a “pause for breath.” For him, this amounts to a temporary cessation on the Pound’s inevitable upward path: “Compared to long term levels, the pound was still better value than its peers. He said: ‘It’s still cheap – about 10% below it’s trade-weighted average at present.’ ” For others analysts, however, the picture is not so cut-and-dried. In short, from a purely economic standpoint, it doesn’t look good for the Pound Sterling. But of course forex is about much more than GDP…stay tuned for Part 2, in which I’ll elaborate on this point, and bring interest rates and inflation into the discussion. For those of you that make a living (i.e. 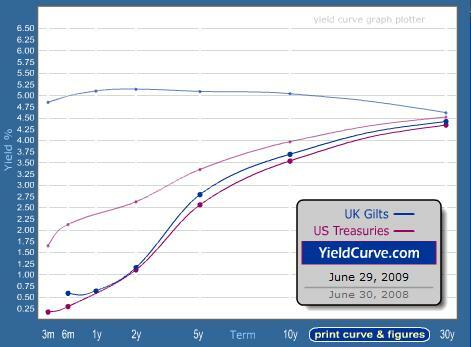 trade forex) from interest rate differentials, consider that the US Treasury yield curve is now steeper than at any point in recent memory. Short-term rates are still close to zero, while long-term rates just passed 4% and are still rising. The theoretical implication is that one can borrow at a low short-term rate and reinvest at a higher long-term yield. The question is: would you want to? At the same time, the Fed voted to maintain (though not to increase) its $1.75 Trillion asset price program, in order to prevent long-term rates from rising. This was probably directed at mortgage rates, which had begun to move higher in recent weeks, leading some analysts to fear that the nascent economic recovery would be stillborn. However, “Part of the rise in rates may be caused by fears that the Fed will allow inflation to get out of control down the road and that it will print money to finance government deficits. 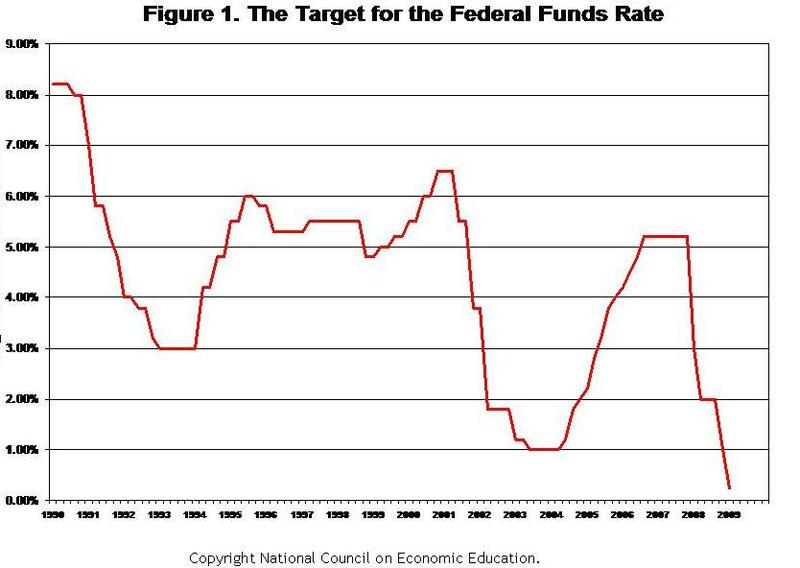 To the degree that those fears are out there, expansion of the Fed programs could be counterproductive, sending rates up rather than down.” In other words, the Fed is naive in its assumption that it can buy rates down, since its very act of buying is actually sending rates up! 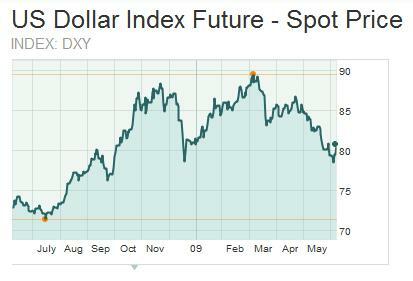 This could be very bad for the US Dollar, which loses on both ends of the curve. Low short-term rates make it cheap to use the Dollar as a funding currency, while high long-term rates imply the expectation of inflation, and thus capital erosion. Current market conditions are unique, however: “The enthusiasm of the past three months has led many to believe that the Fed has actually provided more than adequate liquidity…It is critically important to remember that the dollar is the funding currency whose availability, or lack of … will drive all the markets in the world,” said one analyst. This, the lack of liquidity in credit markets (the very problem that the Fed is trying to counter) is actually good for the Dollar, since it implies an under-supply. On the other hand, if the Fed is “successful” in its asset purchase program, then the supply of Dollars must necessarily increase relative to the demand, in which case the Dollar will fall. It’s not as cut-and-dried as it was prior to the credit crisis, but interest rate differentials (both short and long-term) still hold represent one of the crucial determinants of exchange rates. Back on March 12, the Swiss National Bank issued a stern promise that it would actively seek to hold down the value of the Swiss Franc (CHF) as a means of forestalling deflation. 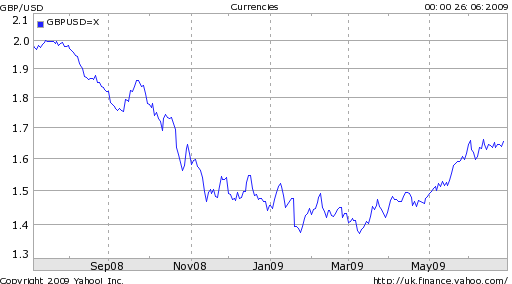 The currency immediately plummeted 5%, as traders made a quick determination that the SNB threats were made in earnest. 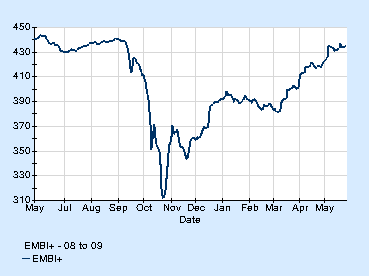 Over the months that followed, however, investors became complacent and the Franc slowly crept back up. 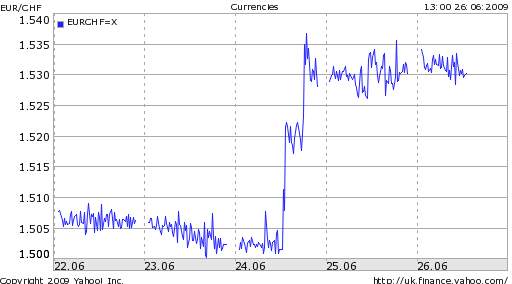 Analysts have speculated that the SNB is (arbitrarily) targeting the exchange rate of $1.50 Francs/Euro, which is plausible given that the intervention occurred very close to that level: “They’re trying to put a line in the sand at 1.50. There’s a big debate as to whether they will continue doing this, and for how long they will remain successful.” After all, the idea of intervention is more effective than intervention itself. The SNB can only buying so many Euros; the real value is in the threat to continue buying, which keeps investors from building up speculative positions. While the SNB has been criticized as “protectionist” for its actions, its premise for intervention is well-grounded. According to the OECD, “Switzerland should keep interest rates close to zero well into 2010 and mull more fiscal stimulus to fight a deep recession and the risk of deflation.” Modest deflation has already set in, facilitated by a collapse in aggregate demand. Varying forecasts are calling for an economic contraction in 2009 equal to -2.5%-3%, and even a modest contraction to follow in 2010. Q1 GDP growth was negative and the consensus is that Q2 will prove to have been more of the same. If this trend continues, 2009 will be the worst year economically in over 30 years. Still, economic indicators suggest the bottom is soon approaching, and the overall picture is consistent with the rest of Europe. The real concern is that other Central Banks will imitate the Swiss approach. “In the past couple of weeks we have had five or six central banks, including the Bank of Canada and the Bank of England, talking down their currencies. Like Switzerland, they are fearful that currency appreciation could offset the stimulus to the economy,” noted one analyst. Monetary and economic conditions remain abysmal worldwide, and most banks have already exhausted the tools available to them. Interest rates are universally close to zero; fiscal “stimuli” will push the OECD debt/GDP ratio past 100% in 2009; quantitative easing has given rise to wholesale money printing. Currency devaluation may be the only option left. Around the peak a couple weeks ago, the Forex Blog reported that emerging market stocks had become quite expensive, relative to historical P/E ratios. It’s hard to say whether investors were/are operating under similar assumptions when the market pulled back, or rather if they have been driven by other factors. This is because emerging market currencies, like many other asset classes, have experienced a disconnect from fundamentals of late, such that the ebb and flow of risk aversion – rather than any substantive developments – now dictates the movement of asset prices. Analysts looking for clues into why specific currencies were rising against the Dollar ignored the fact that virtually all currencies were rising, albeit some more than others. In other words, it was a Dollar-negative story as much as it was an emerging markets story. Likewise, risky investments are losing value across the board now that risk aversion is back in fashion, not because of a perceived change in emerging markets growth potential. Still, there is much to be nervous about. Latvia still hasn’t dealt with its currency, which some experts think needs to be devalued by as much as 50%. Turkey has yet to sign a loan agreement with the IMF. Russia’s benchmark stock index fell 20% in one day. One of the best proxies for risk levels are credit default swaps, which function like insurance on bonds. If a company/country were to default on its bonds, a holder of a credit default swap contract would be compensated by the writer of the contract. Suffice it to say that credit default swap premiums, especially on emerging market debt instruments, are once again rising, as investors become more worried about the possibility of default. In short, as the global economy reaches a critical phase in the recession, investors will be looking for confirmation, either that a recovery is nearby or still far away. Right now, the consensus seems to have swayed towards the “recovery is faraway” side. However, a sudden uptick in a widely-watched economic indicator could send the pendulum swinging right back in the opposite direction. Can the Fed Control Inflation? This week, the Federal Reserve Bank is scheduled to meet for two days, during which it will debate not only whether or not to adjust its benchmark interest rate but also whether to tweak its Quantitative-Easing program, which is slated to end in August. Futures prices indicate an expectation of nil that the Fed will tighten its monetary policy. Still, there is a definite possibility that the Fed will vote to continue injecting liquidity into credit markets: “Market watchers want to hear if the Fed will announce a plan to buy more than the original $300 billion in long-term Treasurys in order to help tamp down interest rates and keep credit flowing.” In this context, it’s worth asking: Is the Fed focusing on growth at the expense of inflation? To be fair, inflation is currently non-existent. Prices rose at an annualized rate of .3% last month, and have actually fallen, relative to last year. Commodity prices are indeed rising, but seem to be taking their cues from the stock market and abnormal/temporary shocks, rather than a real change in the dynamic between supply and demand. The Dollar is also falling, but Bernanke himself has argued previously that this shouldn’t trickle down to the consumer price level in a significant way. 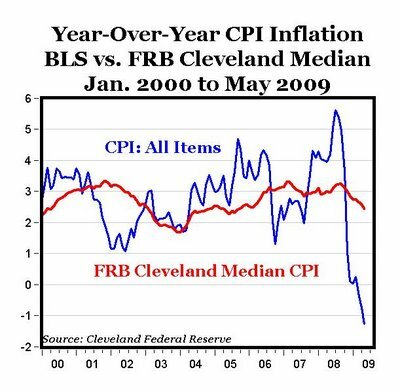 Still, the concern is not that a sudden economic turnaround will drive domestic inflation. “There is growth in the emerging markets…There’s an international demand as well as a U.S. demand. The inflationary pressures are going to be coming from outside the walls of Troy.” But even this is small beer compared to the Fed’s quantitative easing program and the record-setting government budget deficits. Without doing an in-depth, historical study, it’s still reasonable to say that investors are prone to making errors. Consider the euphoria surrounding mortgage bonds up until that bubble burst last year, that in hindsight was completely baseless. With regard to the Fed, one need look no further than the artificially low monetary policy maintained by Bernanke’s predecessor, Aland Greenspan, that has since been blamed for the current recession. Then there is the fact that the optimistic forecasts hinge on two crucial assumptions. 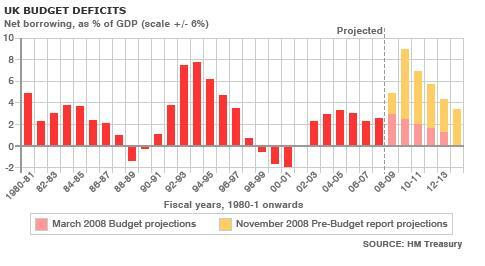 The first is that the economy will indeed recover and that record government (not just the US) deficits will soon abate. The second assumption is that regardless of whether the global economy improves swiftly and convincingly, the increase in sovereign debt can be absorbed by the capital markets. In my opinion, this assumption is both wrong and negligent. Even the optimists expect the ratio of G20 gross national debt to GDP, to surpass 100% for the first time ever this year. [Chart courtesy of The Economist]. Let’s just hope that the investors continue to turn out, and that Central Banks (including the Fed) aren’t stuck mopping up the difference. 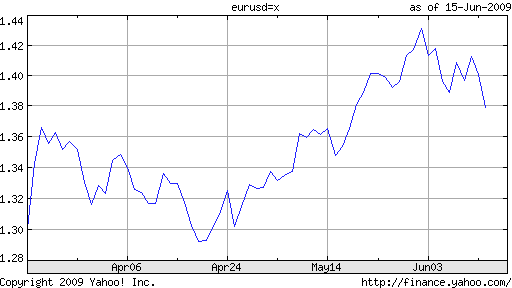 Over the last month, the US Dollar has steadily reversed its downward fall against the Euro. While it might still be premature to pronounce an end to the amalgam of intertwined trends that sent equities, commodities, and emerging market currencies (i.e. anything risky) up and the Dollar down, it’s worth examining this possibility in greater detail. My philosophy of forex has always been to focus on the medium and long-term trends. Over the last two two-three months, the medium-term narrative was one of increased risk-taking. Generally, investors had become both more complacent with risk and more optimistic about the global economy’s prospects for avoiding economic depression. The US financial sector was shored up (or at least “vouched for”) by the US government, and a Fed-driven flood of liquidity poured money into the riskier sectors of the global financial markets. The sideways trending of the USD/EUR doesn’t necessarily imply that this trend has run its course. Instead, I think it suggests that investors are looking for guidance as to what kind of narrative will predominate over the next few months- whether a continuation of the risk-aversion story, or a brand-new story. Investors tend to make their own reality, such that a pattern will inevitably emerge, and investors will find cause to affirm that pattern or negate that pattern. Simply, right now, there is no consensus on what that pattern is. There is good reason for caution. The global economy (and forex markets) stand at a crossroads. Investors (want to) believe that the worst of the recession is behind us. But there is still good reason to believe that this is not the case. Unemployment is still rising, the housing market is falling, and GDP is still declining. Stock market investors may finally have taken notice of this contradiction, as the stock market rally has stalled of late. Meanwhile, long-term rates have begun to tick up, but short-term rates remain frozen at record lows. Some analysts believe that the Fed will tighten monetary policy before the year is out, but the wide daily swings in interest rate futures contracts, imply a complete lack of consensus on this as well. The same goes for inflation, which is near 0% at the moment, but could easily explode as a result of rising recovering prices, record budget deficits, and the Fed’s own quantitative easing program. There is no single event or data point that will shake investors from their uncertainty. Sure, a credit downgrade of US sovereign debt, another large-scale bankruptcy, a strong intimation of an interest rate hike, or a turnaround in GDP would all do the trick. In all likelihood, however, it won’t be so obvious, and investors will continue to selectively cull data that reinforces the case for optimism, pessimism, or further uncertainty. Currency Hedging: Is it Worthwhile? While volatility in the financial markets has certainly declined from the record highs of October, a spike in the last week means that it is still problematic, and hence relevant. With this post, I will examine one theoretical method that has the potential both to limit volatility and to improve returns: currency hedging. Generally speaking, there are a few situations in which currency hedging is useful: international equity/bond investing, currency investing/trading, and inflation hedging. The latter typically involves using commodities/metals to hedge against inflation, which is typically proxied by the Dollar. In other words, inflation hawks might buy gold/oil to offset a declining Dollar. 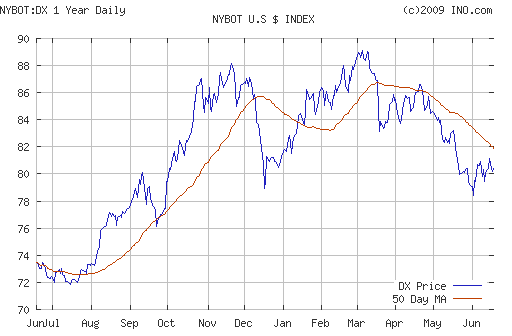 This dynamic is currently on display in commodities markets, where “Speculative money has increased oil’s sensitivity to dollar movements, and if the dollar continues to strengthen, this will weigh on prices.” This type of hedging, however, is probably the most nuanced, and I will set it aside it for another post. Hedging indirect exposure to currencies (from overseas investments) involves the separation of currency risk from credit/equity risk. 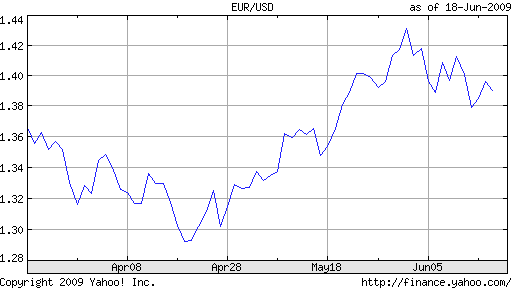 In other words, if you are an American invested in a European stock, you may wish to hedge against fluctuations in the Euro (which impact you insofar as the stock is priced in and pays dividends in Euros, but your account is denominated in Dollar), so that you are exposed only to fluctuations in the stock, itself. Simply, this would involve selling Euros simultaneously with buying the stock; the amount of Euros that you sell depends on what level of exposure to currency risk you are comfortable with. If you buy $100 worth of stock in a European company and buy $100 USD/EUR, then you are fully hedged. Hedging direct exposure to currencies is inherently more sophisticated. For example, if you sold $100 EUR/USD, you can’t hedge your position by simply buying EUR/USD, or you will negate any return without changing the level of risk. Instead, you can use financial derivatives (options, forwards, futures, swaps), which if executed properly, are tantamount to buying insurance on your portfolio. For example, if you are long the Dollar, you can buy put options in order to protect yourself from significant downside. Likewise, if you are short the Dollar, you can buy calls to achieve the same end. I pulled that snippet from a study on currency hedging that I read recently. 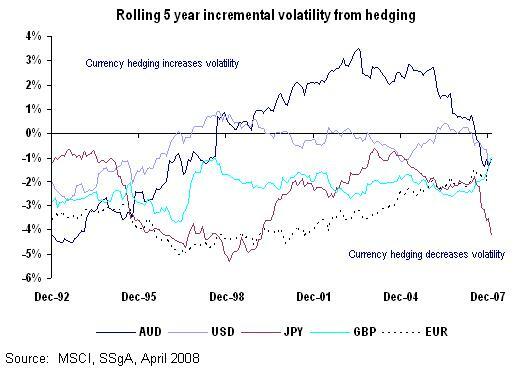 According to this report, “For most base currencies, over most periods, hedging seems to have reduced the volatility of international equity portfolios.” [See chart below]. However, while hedging seems to reduce risk, it doesn’t necessarily boost return. “Again, given one man’s meat is another’s poison, one would expect the results to be distributed evenly around the horizontal axis, and that is in fact the case.” In other words, one currency’s gain is inherently another’s loss. Still, if you could maintain the same returns but limit volatility, why wouldn’t you? While much of this represents posturing as part of the global power game, there is a certain amount of pragmatism reflected in this attitude. After all, the U.S. is projected to run a $1.85 trillion deficit in 2009, bringing the total debt held by the public close to $10 Trillion. Meanwhile, the Fed – through its quantitative easing plan – is both facilitating this debt and potentially stoking inflation. For several reasons then, many analysts view the diversification talk as a distraction, especially as it bears on the forex markets: “The raging debate about the future of the U.S. dollar’s reserve currency status may be masking the real drivers of its near-term direction.” First of all, contradictory and ambiguous statements reveal a complete lack of consensus, not only about whether the current system should be abandoned but also with regard to what form an alternative system would assume. For example, neither the Euro nor the Chinese Yuan represent viable alternatives, since the former is too new and the latter is still not fully exchangeable. Second, even if Central banks and governments decided to make change, it would take years to implement. “The evolution of a reserve currency would be exactly that, an evolution, not an overnight change,” said one analyst. Another added, “The choice of a reserve currency is not made by central bankers; it chooses itself.” In other words, investors will flock towards currencies that are characterized by liquidity and openness and backed by strong capital markets, not on the basis of politics. This leads to the third and perhaps most important point, which is that capital flows by private investors dwarf movements by Central Banks, especially in the short-term. While Central Banks are and should be taken seriously by forex markets because of their size, they still account for only one portion of global (Dollar-denominated) foreign exchange holdings. In the short term, investors will continue to move capital around in accordance with their risk/reward profiles. Barring a sudden shift by Central Banks away from the Dollar (which would be counter-productive and a losing proposition), then, it is these private capital flows which will shape the Dollar’s future in the near-term. Are US Short-term Rates Headed Higher? There are two components that mandate the Fed’s approach to monetary policy in the US: inflation and economic growth. While both indicators are currently at dismal levels, economists are forecasting upticks in 2010. Commodities prices have already started to rebound. Combined with the Fed’s quantitative easing program and consequent explosion in liquidity, this could easily lead to inflation if not “mopped up” as soon as the economy begins to recover. Long-term rates have already begun to rise, due both to an oversupply in long-dated bonds and a decline in demand, as investors turn away from low-yielding assets. But currency traders (especially those that rely on carry trades) tend to favor short-term rates, which means that the Federal Funds Rate (and accompanying interest rates) supersede. While even the most hawkish Fed watchers don’t anticipate a rate hike for many months to come, the shift in forex markets indicates that investors are already calculating their exposure to such a hike. Skeptics, meanwhile, insist that such hawkishness is way overblown and that “investors who bought the dollar recently betting on higher borrowing costs were at a ‘risk. Interest rates are not going to go up in this country anytime soon.’ ” Another analysts chimes in that, “It seems highly unlikely that the Fed will raise rates this year which…suggests that the dollar could come under renewed pressure in the event of a dovish shift in US interest rate markets.” I guess it just depends on what time horizon you look at. With interest rate differentials, growth trajectories, and risk aversion weighing on (forex) markets, there’s no room in the picture for politics. I preface this post accordingly because current market dynamics are such that even the most dramatic political developments (short of the breakup of the EU) would probably be brushed aside. The long-term, however, is a different story, and investors ignore politics at their peril. By its very nature, the Euro is perhaps most vulnerable to the vicissitudes of politics. The last week alone brought two significant developments: the downgrading of Ireland’s debt, and a crisis in Latvia. The former weighed directly in the Euro, while the latter probably didn’t have much of an effect. The reason being is that investors viewed the Irish downgrade as a possible precursor to downgrades in other EU economies. Spain and Italy, for example, are in equally precarious positions, and a 6% decline in GDP means German probably isn’t that far behind. In other words, investors may have to rethink their implicit assumption that the EU is currently less risky than the US. But how do you square fiscal instability against monetary instability? 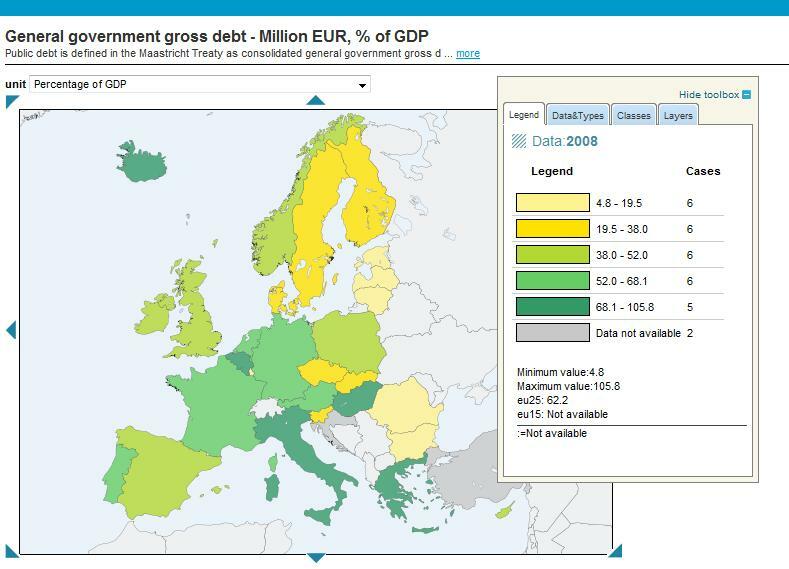 The US is printing money, but EU member states are (marginally) more likely to go broke. Is inflation more conducive to currency devaluation that sovereign bankruptcy? Perhaps the logic is that inflation is acceptable (albeit undesirable) whereas a large-scale default would shake the global financial system to its core; this being the case, it’s probably more practical to bet on the former. The crisis is mainly relevant in that it has turned into a framing point for the future of the Euro, which Latvia is slated to join in 2012. “Euro zone entry would recede since the country would have to restart from scratch in the EU’s Exchange Rate Mechanism (ERM) with higher inflation and a bigger budget deficit.” Given that the EU is already slightly unstable (see above for example), why would it want to bring even more unstable economies into the fold of the Euro? “There is some suspicion that Germany, the EU’s central economy, may want to slow down euro zone enlargement to preserve stability for existing members and perpetuate its orthodox influence over European Central Bank decision-making.” Still, “The EU is a community of law. Treaty rules for joining the single currency cannot simply be torn up in a crisis to admit countries in distress.” In short, there are compelling arguments for both sides. Analysts should watch closely, as the treatment of Latvia (i.e. whether the ECB bends over backwards to help it stay on track) will show how serious the EU is about spreading membership to the rest of Europe. Canada right now seems to typify the contradiction between political posturing and economic reality. GDP dropped by a whopping 5.3% in the first quarter- less than what the Central Bank had predicted but greater than thr 3.7% drop in the previous quarter. “The economy will shrink by 3 percent this year, the central bank predicts. That would be the biggest drop since 1933, according to Statistics Canada. The unemployment rate has also been at a seven-year high of 8 percent the last two months.” The most grim statistic is that “Canadian exports fell an annualized 30.4 percent in the first quarter, led by the automotive industry.” This is particularly problematic for Canada, whose economy is 30% depending on such exports. Meanwhile, Canada’s Prime Minister, Steven Harper, is bandying the term “green shoots” around, and has declared “The worst is behind us now.” I guess it just depends on which statistics you choose to cite. After all, “April data…showed new jobs were created for the first time in six months and sales of existing homes rose the most in more than five years. Credit markets are also improving, with the Bank of Canada’s composite index of financial market conditions rising to its strongest level last month since September.” Still, a majority of surveyed economists forecast economic contraction for at least another quarter. At least the Bank of Canada seems to have two feet planted firmly on the ground. It has warned investors not to expect a rate hike (from the current record low of .25%) for about a year, although it admits that could change depending on inflation. The BOC has thus far abstained from unveiling a massive “quantitative easing” plan to match that of the UK and US, which were subtly gibed for not having viable “exit strategies.” In addition, while Canada’s outstanding public debt has surged past $500 Billion, the country’s debt/GDP ratio is still the lowest in the G8 and projected to remain stable (despite projections of deficit for the next five years). In short, inflation inflation is probably not a realistic concern. What is worrying to the Bank of Canada is the rise in the Loonie, which has surged 14% since March and shows no signs of stopping. 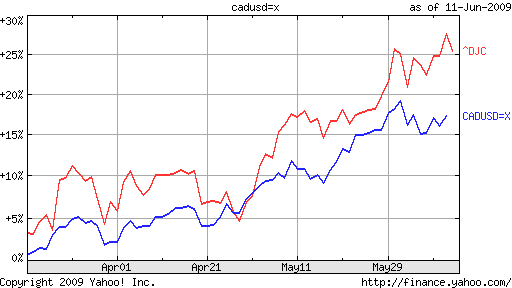 In its decision last week to maintain rates at current levels, the BOC referred to “the unprecedentedly rapid rise in the Canadian dollar (which reflects a combination of higher commodity prices and generalized weakness in the U.S. currency).” Given that it can’t cut rates any further and is reluctant to devalue the currency through printing money, the only real option is for the Central Bank to intervene directly in currency markets, last done in 1998. Analysts, though, reckon that this is extremely unlikely. What would it take for the Loonie to return to a more sustainable level? A decrease in risk appetite, for one thing. If investors got spooked and returned to the Dollar, this would probably crunch the Canadian Dollar. More likely, at least in the short-term, seems to be a retreat in commodity prices. The Loonie has pretty closely tracked the recovery in commodity prices [see chart below], any any pullback in oil and metals would likely be reflected in decreased demand for the currency. A recent report in the NY Times suggested that the surge in Chinese buying activity – which was clearly correlated with rising prices – may soon come to an end. The inevitable fall in commodities prices that would follow will certainly help officials at the BOC to sleep better. Pretty much every brochure advertising forex trading highlights the fact there is no such a thing as a bear market in forex. Stocks, bonds, and commodities can all lose value simultaneously (as happened when Lehman Brothers declared bankruptcy in October 2008) but it’s impossible for all currencies to decline simultaneously. A bear market in the Euro might be offset by a bull market in the Dollar; or Swiss Franc; or Brazilian Real. Regardless, you don’t have to search far to find currencies that are outperforming, whereas a stock picker would certainly have his work cut out for him during an economic recession. I remind you of this cliche because in the current market environment, it has apparently taken on new significance. Anecdotal reports of investors frustrated with stocks, or having been burned by China, or disappointed by the collapse in oil, are flocking to forex by the thousands. Angry about suspended trading rules on stock markets? This could never happen in forex (at least not under current rules), since currencies are traded on multiple exchanges linked through a decentralized system. Here are the stats: at Forex.com, “New accounts have increased about 30 percent a month in the last six months from pre-September levels, while the number of trades per day has risen almost 50 percent. GFT Forex said trading volume rose 187 percent from late 2007 to late 2008….By the end of 2006 [the last year apparently for which this type of data is available], average daily trade volume reached over $60 billion, a 500 percent increase from 2001…Trading volume generated by ‘retail aggregators’ — electronic trading platforms that cater to individual retail traders — rose almost 43 percent from 2007 to 2008.” This dwarfs both overall growth in forex, as well as retail growth in the bread-and-butter securities markets. One trend worth drawing attention to is that new investors are focusing on the most popular currency pairs. [See Chart below, courtesy of Wikipedia]. It has been proposed that this is because of widening spreads (i.e. more PIPs) on less liquid pairs, but it is just as likely being caused by investors applying the stock market logic of “buy what you know” to forex. It is understandable that those new to the game would want to get their feet wet by dabbling in the Euro/Dollar/Yen, rather than diving right in to niche currencies such as the Mexican Peso or even Korean Won, whose movements are both more volatile and more difficult for the average trader to understand. As always, all investors are advised to be on the lookout for scams. In the last few months, it seems hundreds of low-profile forex ponzi schemes have been discovered, which means there are doubtless hundreds of more still flying below the radar of the authorities. If you are suspicious, check out the National Futures Association registry. 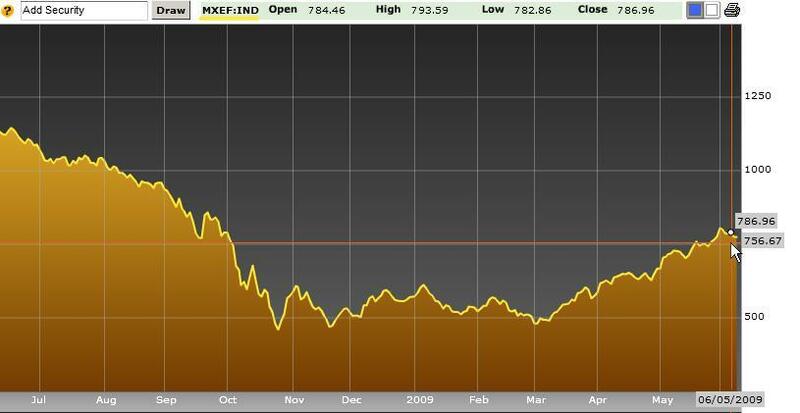 Bubble in Emerging Markets FX? What’s wrong with a little optimism? Well, nothing, in theory. In practice, however, unbridled investor optimism usually spells disaster. Consider that emerging market stocks (based on the MSCI emerging-markets index) now trade for 15x-earnings, the highest level since December 2007. Does anyone remember what happened next? 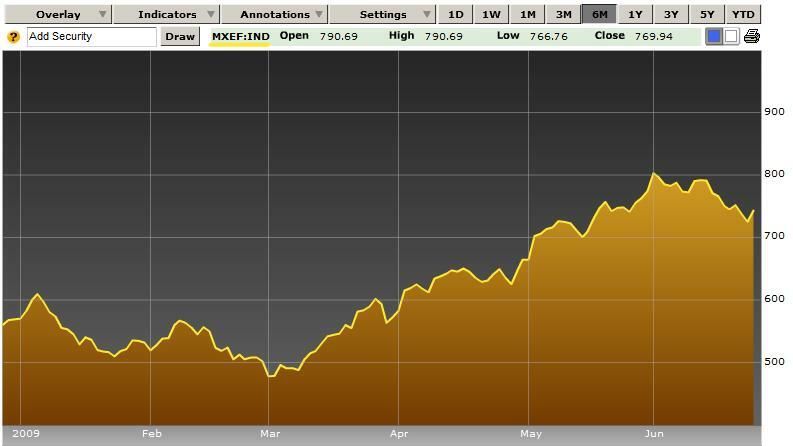 The index plummeted 22% in a matter of months. Meanwhile, “The extra yield investors demand to own developing nations’ bonds instead of U.S. Treasuries fell…to 4.19 percentage points, according to JPMorgan Chase & Co.’s EMBI+ Index.” The index has now erased nearly all of its losses from the last year. In some ways, this is even more unbelievable than the rally in stocks, since it indicates that despite the current recession and strained finances, investors are just as willing to lend to companies in developing countries as they were prior to the downturn! Who cares about stocks- tell me about currencies! “Unsurprisingly stock markets in Asia have been highly correlated with regional currencies over recent months, with almost all currencies in Asia registering a strong directional relationship with their respective equity markets.” The Indonesian Rupiah is up 11% this year and the Indian Rupee is now up 4%, to highlight only a couple. Only a few months ago, these currencies were tracking at double-digit percentage declines! A culling of analysts’ soundbites reveal the usual lack of consensus. On the one hand, “The pattern signals an ‘imminent’ drop;” “Fund flows at their extremes are contrary indicators;” and “Investors are starting to doubt the sustainability of how much longer this very sharp rally can continue.” But for every bear there’s a bull: “There’s a lot of money looking for decent returns and that’s going to continue driving emerging markets.” In short, you can find literally thousands of analysts and their respective forecasts to support either hypothesis. I would argue that the sustainability of this rally (both in stocks and in currencies) hinges on a return to GDP growth in emerging markets. [The IMF forecasts 1.6% growth in 2009 and 4% in 2010]. But given the gap between share prices and earnings, I’m frankly not convinced that investors actually care about whether the rally is supported by actual data. Instead, investors have complacently been swept up by the same herd mentality that produced the bubble of 2008, and could potentially lead to a rapid and painful collapse in what looks to be the bubble of 2009. In my experience, currency markets (and most other securities) markets tend to be governed by trends. There are short-term trends, long-term trends, and medium-term trends. Granted, this is an oversimplification, but generally speaking, if you were to chart a given currency pair, you could characterize its fluctuations in accordance with this paradigm. Short-term trends are typically the focus of technical analysts, who ignore the broader forces affecting a given currency pair and instead try to discern slight trading patterns. Long-term trends, on the other hand, are the purview of economists, and reflect interest rate and growth differentials. Medium-term trends, meanwhile, unfold over a period of months (sometimes shorter, sometimes longer) and require a combination of technical and fundamental analysis to discern and trade successfully. With this post, I want to focus on the current medium-term trend, which is that of declining risk aversion. I would not use the expression “old” news to describe the stock market (and accompanying) rallies that have taken hold broadly since the beginning of March, since it’s still be unfolding. Given that hindsight is 20/20, it now appears that the (perceived) stabilization of the US financial sector provided the impetus for the rally. In the weeks that followed, investors pulled an about-face and piled back into risky sectors and trades. The US stock market rapidly reversed course and is now trading around the level following the Lehman Brothers collapse last October. The rally in March marked the end of one medium-term trend and the beginning of a diametrically opposed, but conceptually similar medium term-trend. Sorry to make it sound complicated, since it’s actually quite simple; in an overnight switch, investors went from being bearish and risk-averse to bullish and risk-seeking. These mindsets (and the switch between) is also reflected in currency markets. 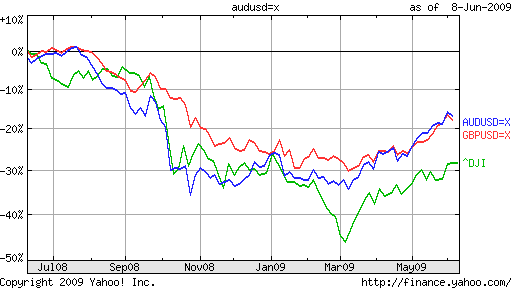 You can see from the chart below how the Australian Dollar, British Pound, and Down Jones Industrial Average have tracked each other closely over the last year, and moved in lockstep since March 3. I suppose you could say that the correlation between US stocks and currencies represents one continuous long-term trend, and based on this chart, you would be making an accurate assessment. However, it’s equally important to unveil the underlying mindset that is driving both stocks and currencies, and is causing them to move in tandem. This is a nuanced distinction, and an important one to understand. There is a difference between a change in sentiment that causes investors to simultaneously pour money into risky investments (stocks and currencies, etc.) and a change in sentiment that causes a stock market rally and consequently, a currency rally. In the first scenario, both currency traders and stock market investors are in tacit agreement over risk-seeking, while in the second scenario, currency traders are uncertain, and hence taking their cues from the stock market. Part of what makes a good currency trader is discerning which of these scenarios accurately describes the current reality in forex markets, so that a viable forecast and trading strategy can be implemented. Scenario 1 suggests that if the stock market rally falters, risky currencies will also decline. Scenario 2, meanwhile, suggests that currency traders would maintain their positions even in the event of stock weakness, which would cause the correlation between forex and the S&P to break down. The last week brought a few more developments in China’s quest to turn the Yuan into a viable reserve currency. Don’t get me wrong – I used the term “inches” in the title of this post for a reason – the Yuan will not supplant the Dollar anytime soon, if ever. Still, China deserves credit for their resolve on forcing the issue, as well as for providing an alternative to the Dollar monopoly. These soft endorsements were precipitated by comments from a top Chinese banker that companies should start to issue bonds denominated in Yuan. “Guo Shuqing, the chairman of state-controlled China Construction Bank (CCB), also said he is exploring the possibility of issuing loans to trading companies in yuan, allowing Chinese and foreign companies to settle their bills in yuan rather than in dollars.” This would serve two ends simultaneously; not only would Chinese capital markets be strengthened, but the Chinese Yuan would benefit from the increased exposure. Already, “HSBC and Standard Chartered have both said they are preparing to issue bonds denominated in yuan” and international monetary institutions might not be far behind. Conspiracies aside, the Chinese Yuan will become a reserve currency when it is ready to become a reserve currency. I’m sure this seems self-evident, but it’s important for China (and China watchers) not to get ahead of itself. It doesn’t make sense for risk-averse investors to hold a currency that is still essentially pegged to the US Dollar and that isn’t fully convertible. If there’s no pretense that the Yuan fluctuates in accordance with market forces, and if investors aren’t guaranteed the ability to withdraw RMB if need be, what possible reason would they have to hold it in the first place? Summarizes one columnist, “China would have to gradually make the yuan convertible on the capital account; it needed a more liquid foreign exchange market; its bond markets and banking system needed to be more developed; and there had to be proper monitoring of cross-border capital flows.” The importance of having functioning capital markets cannot be understated. Simply, investors and Central Banks buying Yuan would not want to simply invest in paper currency; instead they would want stocks and bonds that trade transparently. Currently, foreign investors are limited to savings accounts and investing/lending to firms that record earnings opaquely and are ultimately subject to the whims of the Central government. This system has functioned well in the past, only because investors were betting generally on the Yuan’s appreciation, and not necessarily on specific opportunities within China. If China wants the Yuan to be a serious contender with the Dollar, it needs to give investors more and better options. Ironically, if China had taken these steps in the past, it wouldn’t have found itself with $2 Trillion worth of Dollar assets that it is desperately trying to dispose of. A Tax on Forex Trading? While Brazil and England/France appear to be pursuing different ends, together their plans capture the idea behind the “Tobin Tax.” Originally proposed by Nobel Laureate James Tobin after President Nixon declared the end of the gold standard, the tax would be levied on all forex transactions with the proceeds deposited in forex stability funds. 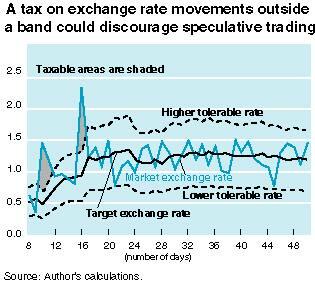 One of the most popular versions would only impose the tax during periods of volatility (i.e. speculation) so as not to punish those exchanging currency for “mundane” reasons. While still a fringe idea, the tax initially gained momentum following the 1997 Southeast Asian economic crisis, and has found new followers in the wake of the ongoing credit crisis. Consider the unprecedented volatility in currency markets of late, manifested in wild daily fluctuations. Even the US Dollar, the world’s reserve currency, has been on a veritable roller coaster of late, rising and falling by 10% in a matter of months. 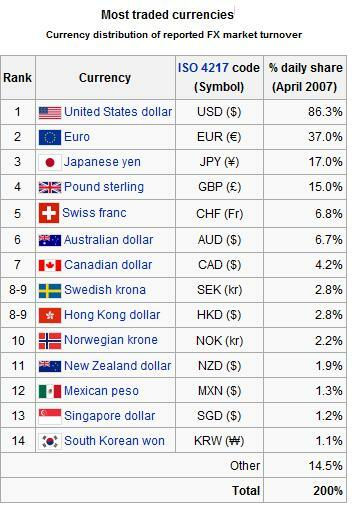 Prior to the rise of forex speculation (already a $1 Quadrillion/year market! ), it was rare for a currency to move that much in a year. Given that such speculation probably accounts for 90% of daily turnover, it seems obvious as to who is causing this volatility. A Tobin tax would work both to minimize speculation in the short-term (by taxing trades) and promote stability in the long-term (by providing Central Banks with funds that they can use to fight speculative “attacks.” Besides, given that forex traders already enjoy favorable tax treatment – i.e. taxed below the short-term speculative rate – it wouldn’t be the end of forex trading as we know it. 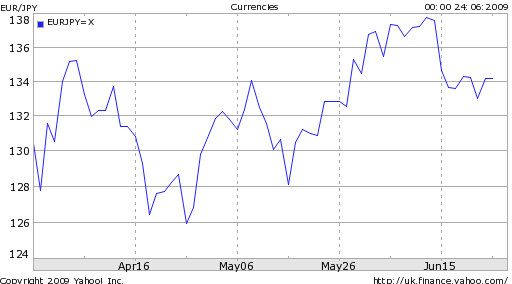 Speaking of seven-month lows, did anyone notice that while the US Dollar was busy declining against pretty much every other tradable currency that the Japanese Yen was doing the same? 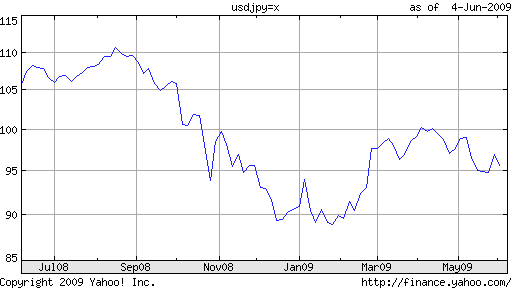 The Yen has remained rangebound against the Dollar for the last three months – the period during which the market rally and Dollar decline have taken place – which just by simple mathematics explains why it has also fallen to a seven-month low around the same time. At the same time, both countries have been aggressive in using fiscal and monetary policy to tackle the economic downturn, both of which could be highly inflationary and lead to currency debasement. Then, again, nearly every economy has responded with the same policy measures, which suggests that low interest rates represent the most plausible factor. It could, however, explain why the Yen is rising against the Dollar, and is closing in on the 13-year high recorded earlier this year. In other words, while both currencies are being sold in the short-term to fund carry trades, investors may have determined that the Dollar will remain weaker in the long-term, due to inflation problems. In addition, the US has recorded a net capital account surplus with Japan of late, which implies that Japanese are net investors in the US- not the other way around. The government of Japan is equally confused, and is “in the middle of analyzing what is driving the yen higher.” Still, it insists that forex intervention is not currently on the table. If Japan’s economy contracts by another 15% next quarter, however, I wouldn’t be surprised if it did an about-face. Imminent Crisis in Forex Markets? The only thing predictable about currencies these days is that they will remain unpredictable. Forgive me for speaking in cliches, but when you consider that the last twelve months have seen both record rises and record falls, I think a cliche might be justified in this case. We’ve seen the Dollar soar, only to collapse again. On the other side, we’ve seen the bottom fall out from emerging market currencies, before rising 20-30% in a matter of weeks. Volatility levels have certainly declined (see Chart below) from the record highs of October 2008, when Lehman Brothers collapsed. 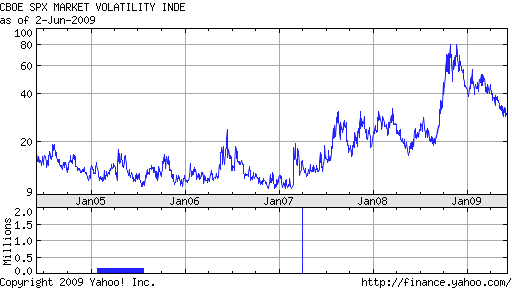 At the same time, the oft-cited VIX index remains well above its average over the last decade. This suggests that while investors may have been lulled into a relative sense of security, serious doubts remain. If the current rally is to be seen as “legitimate,” then perhaps the worst of the 2008-2009 recession is truly behind us, and the global financial system has been given a reprieve from a meltdown. The concern going forward then will naturally shift past the steps that governments and Central Banks are taking to fight the crisis, towards the long-term economic impact of those measures. Jim Rogers, a famous and perennially outspoken investor, is now sounding alarm bells over the possibility of “meltdown” in currency markets, due to inflation and currency debasement that he views as an inherent byproduct of quantitative easing and deficit spending. Most of the attention is being focused on the US, whose stimulus and monetary programs are probably larger than all other economies in the world, combined. Offers one analyst, “We keep very low U.S. Dollar exposures because we think a further devaluation of the greenback is imminent, and we see a structural weakness for at least a number of years.” Meanwhile, there is speculation that the US could soon receive a ratings downgrade, following a similar threat by S&P directed towards Britain. But this remains highly unlikely. The problem that Rogers (and all other investors who are worried about currency debasement) faces is how to construct a viable strategy to protect yourself and/or exploit such an outcome. Rogers himself has admitted, “At the moment I have virtually no hedges…I’m trying to figure out what to do there.” The difficulty can be found in the inherent nature of currencies, whose values are derived relative to other currencies. While you can short the entire stock market or the entire bond market (via market indexes), you can’t short all currencies simultaneously- at least not yet. Of course, it would it be unfair to so glibly dismiss the Pound, so let’s look at the underlying picture. On the macro-level, the British economy is still anemic: “Gross domestic product dropped 1.9 percent in the latest quarter, the most since 1979, according to the Office for National Statistics. The International Monetary Fund now expects the British economy to shrink by 4.1 percent in 2009.” Without drilling too far into the data, suffice it to say that most of the indicators tell a similar story. The only relative bright spots are the housing market and financial sector. Mortgage applications are rising, and there is evidence that housing prices are slowing in their descent, perhaps even nearing a bottom. Optimists, naturally, are arguing that this signals the entire economy is turning around. History and common sense, however, suggest that even if the most recent data is not a blip, it’s still unlikely that the UK will able to depend on the housing sector to drive future growth. Besides, there is anecdotal evidence to suggest that foreign buying (due to favorable exchange rates) is propping up real estate prices, rather than a change in market fundamentals. The stabilization of financial markets is also good for the UK, as 1/3 of its economy is connected to the financial sector. “Sterling is basically a bet on global financial well-being…Now that the banking sector has stepped away from the Armageddon scenario, the prospects for London and the U.K. economy look better.” But as with housing, it’s unlikely that the financial sector will return to the glory days, in which case the UK will have to turn elsewhere in its search for growth. What about the Bank of England’s heralded attempt at Quantitative easing? While it’s still to early to draw conclusions, the initial data is not good. In fact, the most recent data indicates that half of the bonds that the BOE bought last month (with freshly minted cash) were from foreign buyers, which causes inflation without any of the economic benefits from an increase in the domestic flow of money. Given that S&P recently downgraded the outlook for UK credit ratings, it’s no surprise that foreigners are moving towards the exits. In short, “With underlying weakness in money and credit – plus large gilt sales by overseas investors – we doubt that quantitative easing is playing much direct role in the economy’s possible turnaround,” summarized one analyst. If you ask me, the Pound rally is grounded in nothing other than naive technical analysis, which relies on indicators that are largely self-fulfilling. In other words, if the Pound seems like it should rise, than it probably will, simply as a result of investor perception. “Citigroup Inc. said in a report last week the pound is ‘among the most undervalued major currencies…’ Barclays Plc predicts it will rise as much as 18 percent against the dollar and 11 percent versus the euro in the coming year. Goldman Sachs Group Inc. sees a 23 percent gain versus the dollar and 15 percent advance against the euro.” Call me skeptical, but it’s hard to understand what kind of analysis underlies these predictions other than simple intuition. Sure the Pound was probably oversold, but is a 20% rise is two months really justified? The U.S. Commodity Futures Trading Commission data indicated a slight downtick, but “big speculative players continue to hold large net short positions in the pound versus the dollar,” which suggests that the savviest investors are not yet sold on the rally. Emerging markets offer growth and higher yield. Commodity currencies, such as the Australian and New Zealand dollars, rise in line with energy and commodity prices. Someone please tell me where the Pound fits into this? The rally in emerging markets that has unfolded over the last couple months has been especially kind to Brazilian investments, as well as to its currency, the Real, which “has gained 26 percent since March 2, the biggest advance among the six most-traded Latin American currencies. In May, the real climbed 11.2 percent, the strongest advance since April 2003.” The currency has already touched a seven-month high, returning to a level last seen before the collapse of Lehman Brothers send a shock wave through global financial markets. There is now a strong amount of circularity in the relationship between the Real and Brazilian stocks/bonds, such that both are strengthening simultaneously. 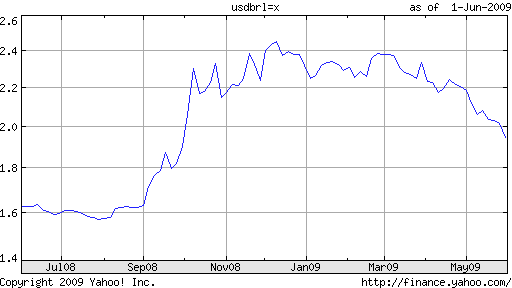 Accordingly, foreign (institutional) investors are rushing back into Brazil almost as quickly as they left: “More than $7.7 billion of foreign money has entered the Brazilian stock market in the year through May 12.” The direct shift of funds from the US to Brazil as especially staggering: “Central bank data on Wednesday showed net inflows of U.S. dollars to Brazil totaled $2.06 billion this month through May 15.” [Granted this data is now two weeks old, but the trend remains intact]. Naturally, there are analysts (I would call them apologists) who point to positive economic developments and a resurgence in commodities as the underlying cause for the Real’s increase. In my opinion, this explanation is patently absurd, given that Brazil’s economy is forecast to shrink in 2009, along with every other economy. The “real” reason for the Real’s performance is the country’s relatively high interest rates. The Central Bank has cut interest rates by 350 basis points this year, bringing the benchmark selic rate to 10.25%. To put things in perspective, this rate constitutes a record low for Brazil, whereas in most other economies it would be considered unfathomably high. Futures markets indicate that rates will fall further over the course of the year, the extent of which depends on how well the Brazilian economy performs in the second half. [It is forecast to grow by 3-4% in the fourth quarter]. Still, even a cut to 9% would still preserve a lofty differential between Brazil and the rest of the world. The Bank of Brazil has repeatedly conveyed its dissatisfaction with its rising currency, even though it remains well below 2008 levels. It has purchased Dollars on the spot market every day for the last month, and is reputed to be considering a foreign exchange tax on foreign capital inflows, both to no avail. “We expect this flow of dollars to continue to go to Brazil, we expect the economy to grow. So, the probable scenario in terms of currency is that we are going to see the real gaining,” summarizes one analyst. At this point, it seems the only thing that would dent the implicit optimism of foreign investors is another shock to global financial markets- one of similar magnitude to the Lehman bankruptcy.